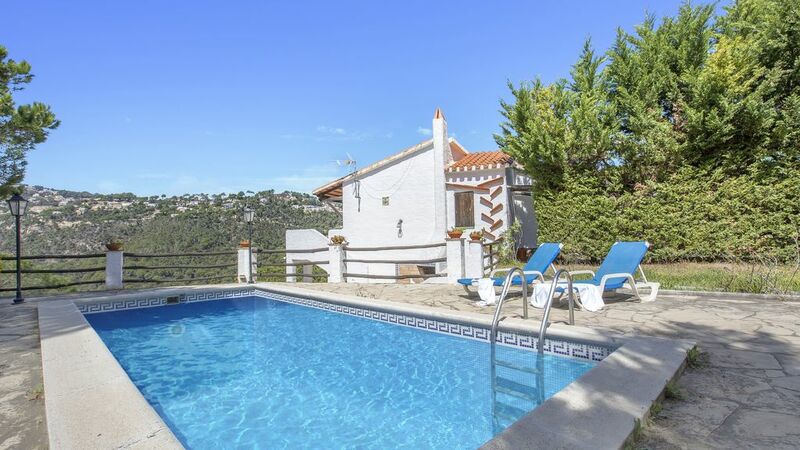 Ibizan style house with private pool, only 2 5Km from the beach. Villa Ibicenca is an unmistakable style house where the predominance of white and its own architecture allows moving to the Balearic Island. 8 km from the center of Tossa de Mar (6 km from the center of Lloret de Mar). Located in the quiet urbanization of Font de Sant Llorenc on a plot of 750m2 and 130m2 habitable has a capacity for 6 people and is distributed on two floors. The ground floor has a room with double bed and two double rooms with twin beds, all with access to terrace and garden; and two bathrooms with bath. On the top floor are the living room with access to the terrace and equipped with TV and fireplace; kitchenette with microwave, oven, fridge freezer, dishwasher; a clean up; and laundry room. The outer zone is composed of a pool of 7x3. 5m, barbecue area, private garden, parking and swings for children. Wi-fi optional. extra price if use 50 € / week.